Last week was notable for several terrorist attacks in Afghanistan attributed to either the Taliban or the local Islamic State network known as Khorasan Province. 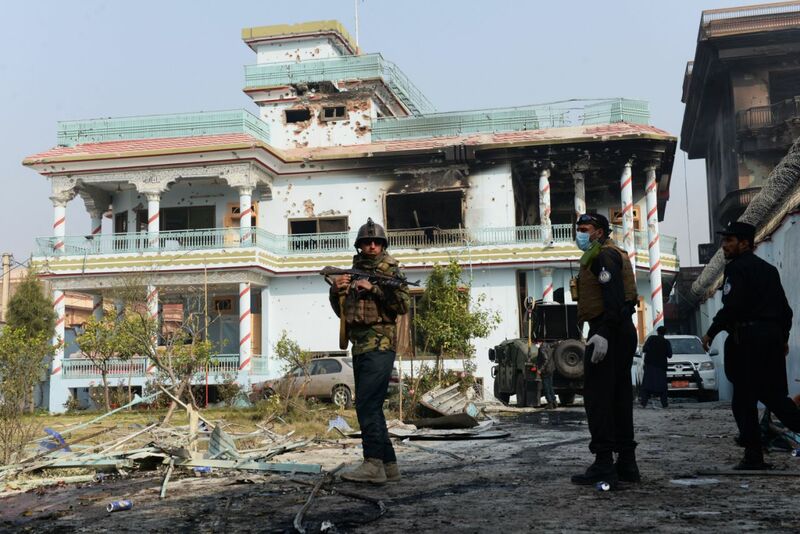 Beginning with a 12-hour siege at the Intercontinental Hotel by Taliban militants on January 21st that resulted in at least 22 deaths, the people of this beleaguered country have faced relentless and unimaginable suffering. On Wednesday, in the eastern city of Jalalabad, Islamic State gunmen stormed the offices of British charity, Save the Children, killing three people and wounding at least 20, officials said. The toll could have been much higher in the course of the nine-hour gun battle between the militants and soldiers, but it appears that charity staff were able to hide in a “safe room” and remain undiscovered. And, on Saturday, more tragedy struck when a suicide bomber detonated an ambulance packed with explosives outside a hospital in central Kabul, killing at least 95 people and wounding 158. Taliban insurgents claimed responsibility for the midday attack, which left bodies strewn across several blocks in a crowded section of the city. The attacks coincide with an announcement by the U.S. military that they will expand its presence in the country by several thousand troops and taking on new roles. These include training Afghan special operations forces and air force pilots and becoming more actively involved in combat support in an effort to turn the tide of a 16-year conflict that shows no signs of letting up, begging the question: why is the United States still active in the Afghanistan despite a growing list of presidents’ promises to reduce troop numbers? Without structural changes in the central and provincial government, there is no chance of overcoming the insurgents. One possibility for continued American involvement there is that is an attempt to counter the influence of neighboring Pakistan whose history of providing a safe haven to numerous extremist groups including the Taliban, Al Qaeda and the Haqqani network has contributed tremendously to Afghanistan’s instability. Earlier in January, the United States suspended security assistance to Pakistan because of the failure of the government to adequately clamp down on terror groups within its borders. Pakistan is just one of nine countries with nuclear weapons, which combined with its mercurial military- and intelligence-led government, necessitates a delicate approach from outsiders, including the U.S., to prevent further regional decline. Since 2001, the United States has spent approximately $830 billion fighting the war in Afghanistan. 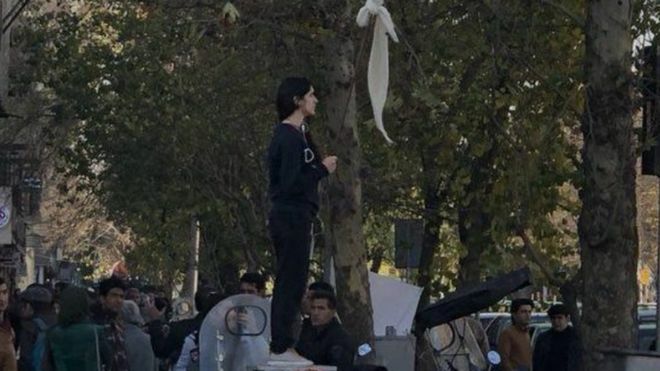 On January 22, the Persian BBC confirmed the reports of the December arrest of a female activist for bearing her head while waving her white hijab on a stick (photo below, source unknown), a punishable defense in Iran. The act took place on December 27 after which whereabouts were unknown. There is international pressure for transparency regarding the current condition and detention location of the unnamed protester, which have not been released. A Twitter campaign dedicated to finding the detained protester, #Where_is_she and #WhereIsShe, has incited human rights activists around the globe seeking answers. On Tuesday, 12 camels were disqualified from a camel beauty pageant in Saudi Arabia after their handlers were caught using Botox on them. In response, neighboring Oman proudly shared that there were no such offenses at its own camel beauty pageant. A spokesperson from the Oman Camel Racing Federation said that pageant’s panel of judges, which evaluates the camels on the basis of a number of physical features including, head, ears, lips, neck and tail, are experienced enough to know if they have been injected with drugs to artificially beautify them. Egypt’s presidential election is to take place in March but with all viable candidates effectively eliminated, incumbent Abdel Fattah al-Sisi is anticipated to be elected, unopposed, for a second term. On Wednesday, Lieutenant General (ret.) Sami Anan, the last candidate thought to be a legitimate challenger, was detained after being accused of running without permission. The accusations claim he was utilizing his former positions with the military to create a “wedge” between the armed forces and Egyptian people. Mr. Anan denied the allegations but withdrew from the race a day later. Opponents either endured arbitrary arrests or ended their campaigns following intimidation and character assassinations, though the electoral commission had said it would ensure a fair and transparent election. On Wednesday, President Trump spoke with Turkish President Erdogan regarding Turkish operations in Syria. This came nearly a week after the United States announced it would remain in Syria long-term. President Trump confronted Turkey in its mission of advancing in Syria against Kurdish forces and people. An escalation of force by Turkey will only continue to threaten U.S. allied forces and operations. If cooperation and collaboration between Turkey and U.S. fails, the threat of conflict between the two nations in Syria could be inevitable. On Friday, the United States Census Bureau announced in a news release on its website that it will not create a new category specifically for people from the Middle East or North Africa to be counted on the 2020 census. Advocates for years have been pushing for a new separate geographic category for people of Middle Eastern or North African (MENA) descent because the current options do not reflect the ethnic and racial diversity of the population. As a result, this demographic does not qualify for federal funding and supportive services, nor can its numbers be accurately determined. On Saturday, Saudi Arabia freed Prince Alwaleed bin Talal and several of the kingdom’s most prominent businessmen from detention, clearing out the Ritz-Carlton hotel that served as a jail for the country’s elite during a controversial crackdown on corruption. Alwaleed, the billionaire chairman of Riyadh’s Kingdom Holding Company and owns stakes in Citigroup Inc. and Twitter Inc., returned home after reaching a settlement with authorities. And, lastly, an update on Morocco’s bid to host the 2026 World Cup: the kingdom’s bid committee has unveiled its campaign logo, a move that just might disprove skeptics who have questioned how serious the country is in its 5th attempt to score the coveted host position.